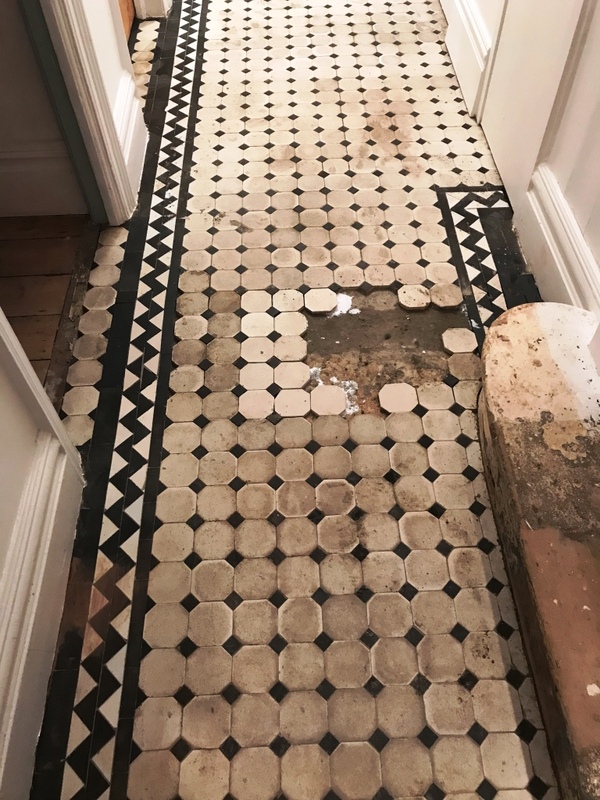 I was asked to look at an old Victorian Tiled Hallway floor at a house in Brixton, South London. 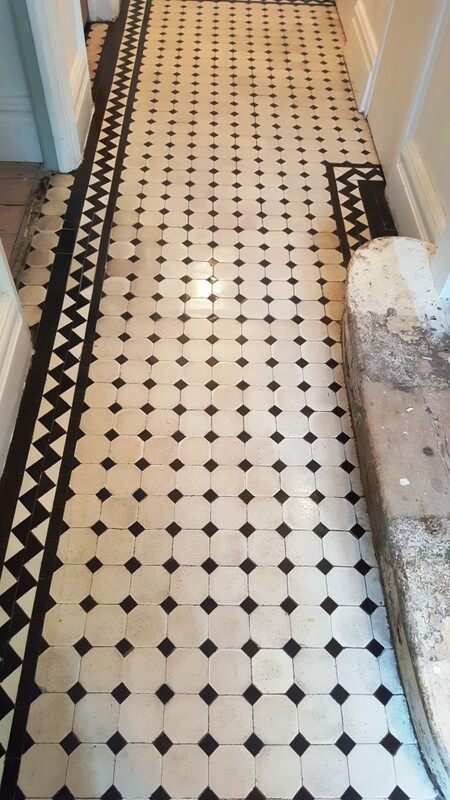 This classic floor had been discovered underneath an old hallway carpet while refurbishment works were being carried out. I went over initially in mid December to survey the floor and talked the owner through a number of similar restorations we had completed in the past. I could see this floor would need a deep clean to remove the years of dirt and also some tiling would needed to be done to tile a section of concrete near the stairs that had been dug out to lay pipe work when central heating had been installed many years prior. She didn’t want to make a commitment at that point so I left her with our quotation so she could think it over. I suspect she had other quotes to review however I’m pleased to say that she decided to give the work to us. Once we had agreed a date to do the work I started looking around for replacement tiles that would be needed to restore the floor. Unfortunately the octagonal ones are not made any more and I couldn’t hold of any salvaged ones either. Having been involved in Tile Restoration work for some time now, I have a list of companies and reclamation yards that are usually a good source for these materials. To resolve the problem I sourced square tiles with a similar look and would cut them to the same shape when on site. I returned after Christmas to start the restoration process which was due to take two to three days. 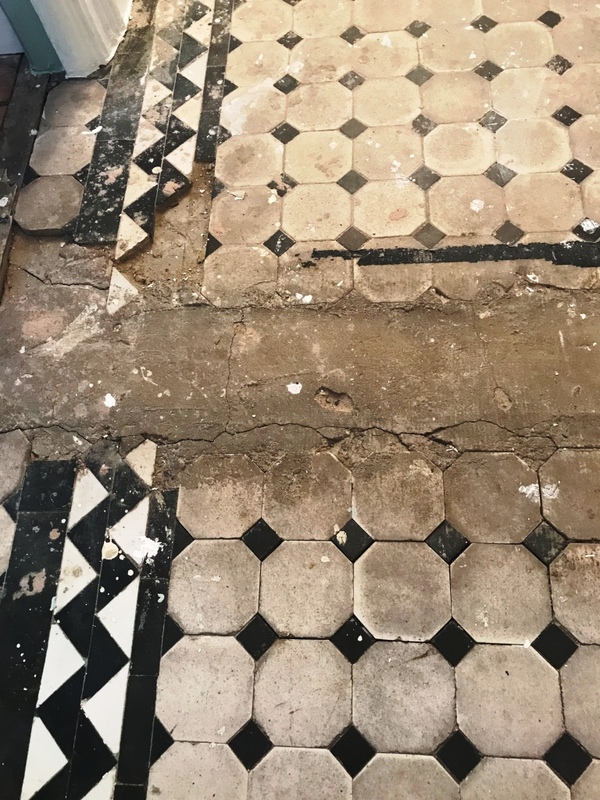 To start the restoration process we applied a strong dilution of Tile Doctor Remove and Go to the floor, allowed it to soak in for ten minutes and then worked it into the tiles using a scrubbing pad fitted to a rotary machine. Remove and Go is a product that removes coatings from tiles including in this case old paint splashes and carpet adhesive. The floor was then rinsed and the now dirty solution extracted using a wet vacuum. Once this was finished the floor was looking cleaner and the next step was to tackle the concrete area near the stairs where the heating pipes had been buried. 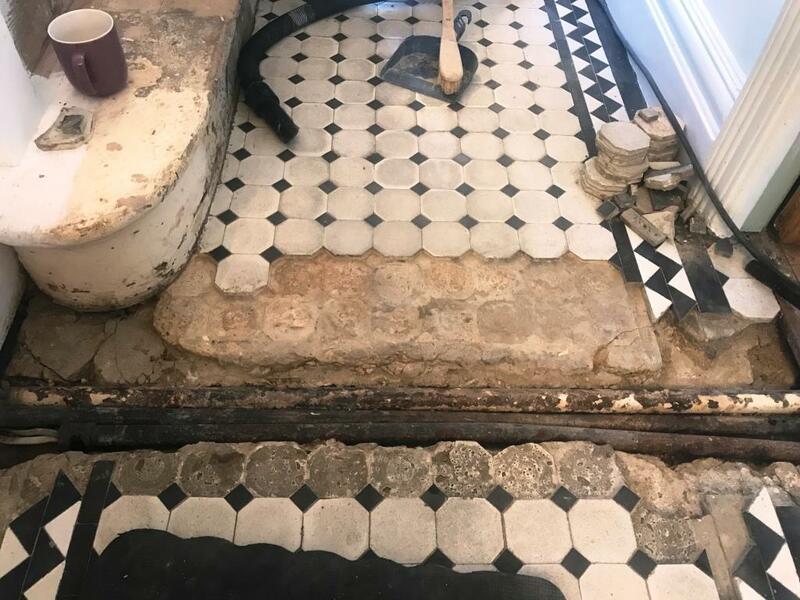 The cement had to be carefully chipped away and then refilled with fresh cement but to the level of the original surface so we could lay new tile on top. 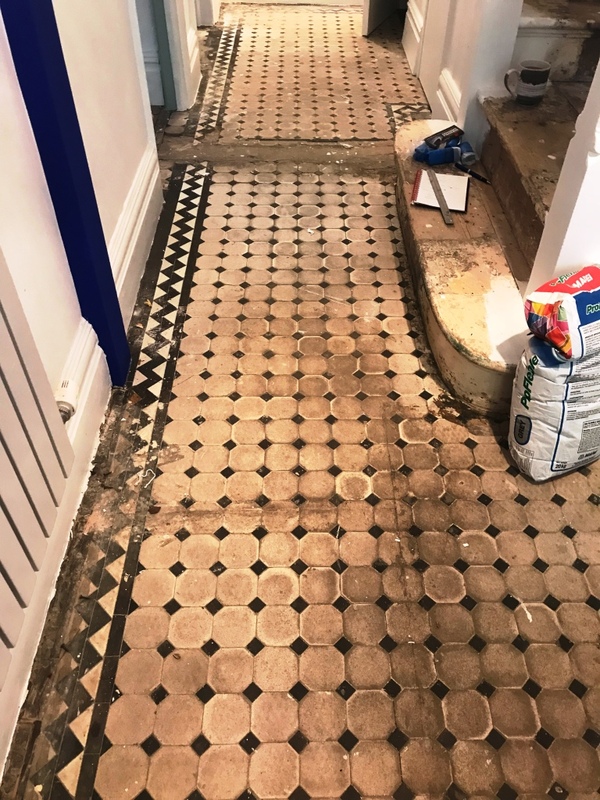 We use a quick setting compound for this and were able to start relaying and grouting the section with new specially cut tiles later that afternoon. Naturally the strip of new tiles were quite noticeable against the old and although the customer was happy I knew I could get a better result by running a very coarse burnishing pad fitted to a heavy buffing machine over the surface. I used a diamond resin hybrid 50 grit pad to take off the top layer of the tiles and then refinished the surface with a 100 and then 200 grit pad. This did the trick and it was impossible to tell the old and new apart. After this I carried out an acid wash using Tile Doctor Grout Clean-up diluted with four parts water. 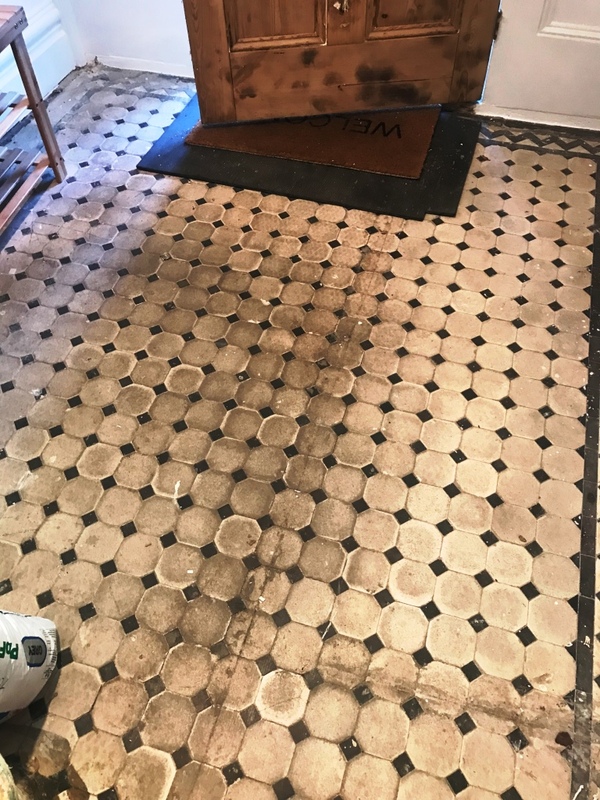 The purpose of this was to remove any old grout smears and mineral deposits from the floor as well as counteract any possibility of unsightly efflorescence salts rising up through the tile at a later stage. This is quite a common problem with these old floors which don’t have a damp proof coarse and certainly I could see no trace of a DPC when I dug out the cement around the pipe work earlier. The last step in the cleaning process was to steam the entire floor and then leave it to dry off fully over the New Year break. 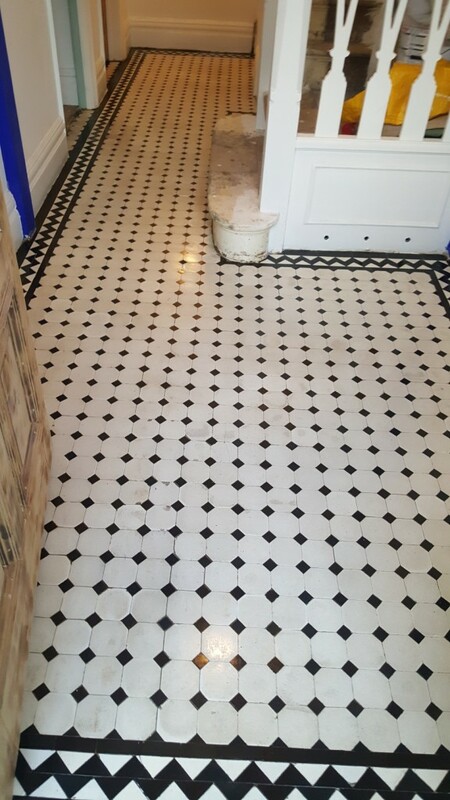 I returned on the 2nd of January and after inspecting the floor to ensure it was clean and free of damp I began to seal it using Tile Doctor Colour Grow which is an impregnating sealer that soaks into the pores of the tile protecting it from within and enhancing its appearance in the process. Four coats of sealer were needed and as you can see by the final pictures the final results were outstanding. 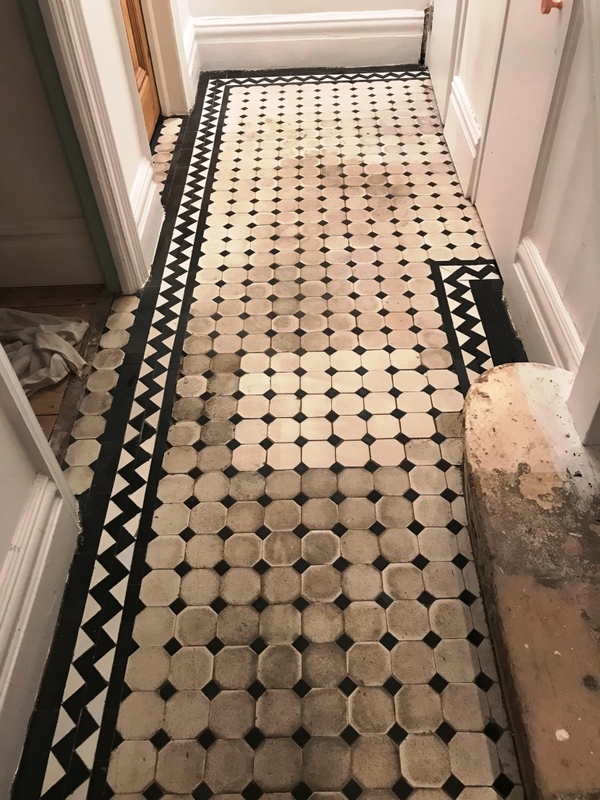 Period features such as old Victorian floors add a lot of value to and the customer was over the moon with the transformation and is so happy she chose to have the floor restored rather than covering it back up with carpet.